Early Saturday morning, various gaming forums (and, more importantly, Reddit) obtained a promotional code from mega gaming company Electronic Arts for their Origin gaming distribution service. This code entitled the user to purchase any EA published or developed game for $20 off, and if the game was less than $20, the game was free. Games that were made free using this coupon included hit series such as Dead Space, Mass Effect, Dragon Age, and Battlefield, so the rewards for the coupon were actually pretty worthwhile. Best of all, there are no catches and no gimmicks; input promo code OS3874XVC, get game. 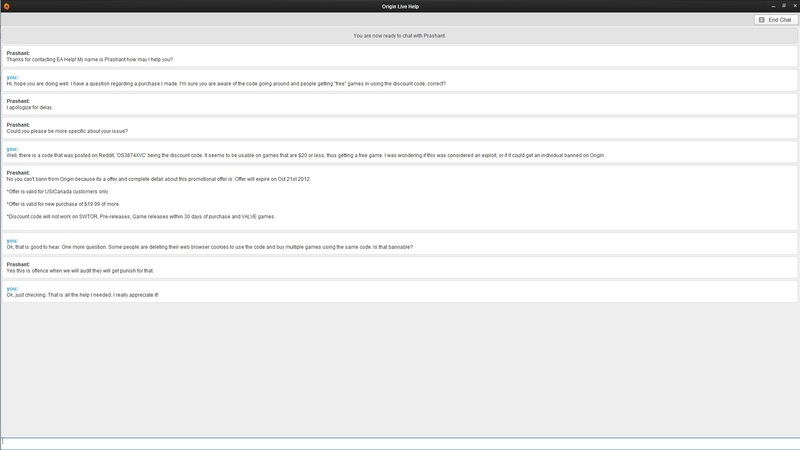 The code was apparently rewarded after taking a survey regarding Origin, with the reward being one free game. The operative word being “one.” Some gamers, out of curiosity, discovered that by entering the code via both the store browser-interface and the store client-interface, they could get a free game twice. Gamers inferred the logical technical conclusion; EA was not checking server-side that the code was only being used once. Later, gamers noted that simply inputting the code while logged-out allows them to use the promo code an unlimited amount of times. Needless to say, hilarity ensued. Never trust the damn client! For some reason, inputting the code in different clients (which should validate against the same backend database) still allowed the code to be input twice. And, for a very confusing reason, a workflow exists that allows the user to input a promo code while logged out, with presumably the intention of it being validated when the user eventually logs in (which it isn’t). The exploit was closed at around 1AM PST, 18 hours after its discovery (which, to be honest, it pretty embarrassing for an exploit that causes a significant amount of lost potential revenue). Here’s where it gets interesting. A little background: in the gaming community, EA is not the most liked company; in fact, it was voted the worst company in America due to a very large number of privacy, security, and ethical debacles. Last year, EA launched its own digital distribution service, Origin, which would compete with Valve’s Steam service by being the sole provider of high-profile EA-published games, including Battlefield 3 and Mass Effect 3. (the former being the only reason I downloaded Origin). Speaking from experience, Origin is very buggy and unpolished compared to Steam, and actually drains system resources when idle. According to another Reddit thread, when news of this exploit hit, many gamers went on a downloading spree, and downloaded nearly every free game possible for two reasons. One, if EA is technically incompetent enough to allow such a severe bug to exist, they won’t have the technical skills to discern who used the promo code more than once. Two, it is retribution for EA being a terrible company. What will EA do to punish people who exploited? Are the users at fault here since it’s very possible to accidently use the code twice? If so, is it fair to ban ever*y*one who has used multiple promo codes if innocent people might be banned? UPDATE (10/15 1:14AM): EA will “honor all sales made with the coupon code,” implying that they will not ban people who utilized the exploit. If the promo was a marketing tactic from Electronic Arts to promote Origin usage, it failed immensely on their end, due to a trivial amount missing lines of code on their server. PS: I downloaded exactly one game through the promo code as was intended and stated by a forum user’s chat log with Origin Support; I did not attempt to reproduce the exploit itself for verification purposes due to the potential consequences. I like my Battlefield 3! If you liked this blog post, I have set up a Patreon to fund my machine learning/deep learning/software/hardware needs for my future crazy yet cool projects, and any monetary contributions to the Patreon are appreciated and will be put to good creative use. Max Woolf (@minimaxir) is a Data Scientist at BuzzFeed in San Francisco. He is also an ex-Apple employee and Carnegie Mellon University graduate. In his spare time, Max uses Python to gather data from public APIs and ggplot2 to plot plenty of pretty charts from that data. On special occasions, he uses Keras for fancy deep learning projects. You can learn more about Max here, view his data analysis portfolio here, or view his coding portfolio here. Copyright © 2018 Max Woolf. All Rights Reserved. minimaxir.com is powered by Jekyll and GitHub Pages.